John J. Meagher C. E.
This addition when completed will become a part of Saint Patrick's Cemetery in Lowell Massachusetts. 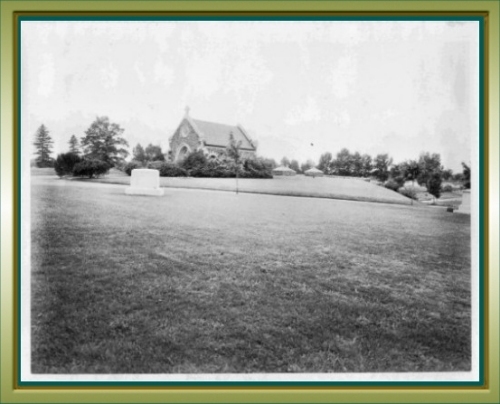 The Cemetery is the property of the Roman Catholic Archdiocese of Boston Massachusetts, and was incorporated in 1832. Originally a plot of four acres set aside for burial purposes in the early days of the city of Lowell the Cemetery has grown through additions made at various times to sixty-five (65) acres. All but twelve (12) acres have been sold. It is the development of these twelve acres that constitutes the subject matter of this thesis. The addition will be laid out on the park plan with winding avenues and paths. 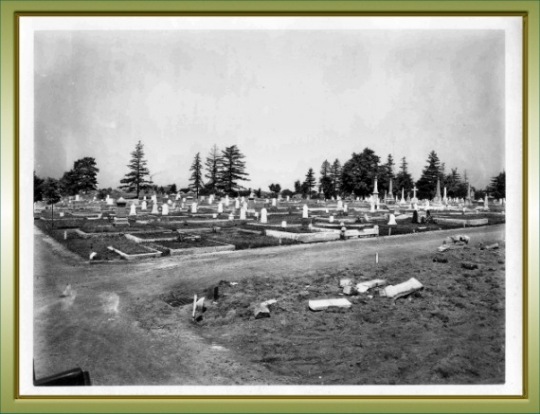 In the early days the development of the Cemetery was much the same as the average country cemetery. In 1860 an addition of ten acres was made which was laid out in rows and paths on the so-called "checker board system'. Practically no restrictions were placed on the lot owners, each lot owner exercised his own ideas with the result that the Cemetery soon became filled with curbings and monuments. About forty acres had been sold in this manner up to 1919. In that year curbings were banned. A ruling was made that all monuments must have foundations and numerous other restrictions made tending to correct past mistakes. In 1925 a rule was made that all lots be sold with Perpetual Care. The improved appearance of sections sold under this plan prompted the idea to regrade the older parts of the Cemetery inasmuch as one had to pass through these old sections to get to the new sections. 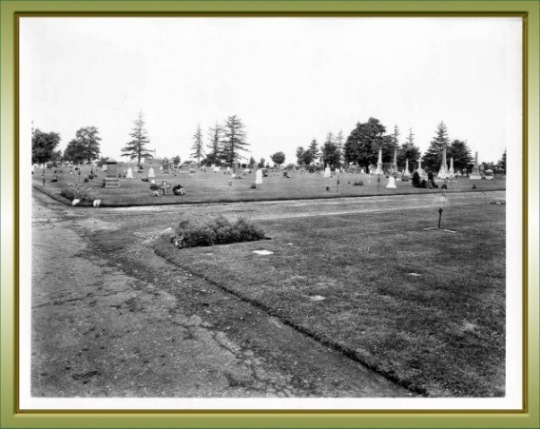 In 1926 work was started on the regrading of the old sections of the Cemetery and certain parts of the Cemetery have been done each year up to the present time. Curbings were removed in large numbers with the aid of derrick trucks, monuments were realigned and whenever necessary foundations built. Numbered concrete markers were placed flush with the grade on the lot corners. All lots are now at grade and are kept mowed by power-lawn-mowers. Twenty men have been employed each summer for the past eight years. Fifty thousand dollars have been spent and approximately twelve thousand lots of various sizes have been regraded covering an area of twenty-six (26) acres. About fourteen (14) acres of the old sections remain to be regraded. These facts give some idea of the cost of poor layouts and lack of proper restrictions. These sections adjoin the proposed new addition and will have a bearing on the design. The area under consideration will be ample for the future growth of the Cemetery for approximately twenty-five years. Being within the city limits we are hemmed in on all sides. When this land is sold a new location elsewhere must be found. Estimating the demand for various sizes of lots is a problem especially over a period of twenty-five years. We know for instance, the ratio of single graves to four grave lots sold during the post five years. On this basis we could allot proportional areas to these sizes. Business conditions, however have a definite effect on these ratios. During the depression there was a definite trend toward small lots. When the rule that all lot owners must buy their lots with Perpetual Care was put into effect the natural reaction was to buy small lots due to the increased cost, although lot owners were given a year in which to pay the Perpetual Care. It is very probable that most sections will be laid out in small plots with a small percentage of the lots in the better locations laid out as ten grave lots or over. The Cemetery is indirectly in charge of a Director who represents the Archdiocese of Boston. Weekly reports on the conduct of the Cemetery's business are made to him. Plans and changes such as contemplated in this addition must receive his approval. Directly the Cemetery organization consists of the Superintendent, Assistant Superintendent, Foreman, and about twenty-five workmen. With the possible addition of several more workmen this organization will supervise the work of building the new addition and the maintenance afterward. The site is composed of two long flat slopes with a valley in the center. In one corner of the addition there is considerable ledge., so much so that it will be left where it is. It is planned to plant rock garden plants at the base of the outcropping and crevices and keep, insofar as possible, the natural beauty of the spot. There is practically, no vegetation on the site. Trees and shrubs must be supplied. The loam is of a rather poor quality and must be built up with humus and fertilizer before satisfactory lawns can be grown. The sub-soil is yellow sand. In about one half the area, five feet down, is a layer of clay. It is possible that sub-soil drainage must be supplied for this area. The City of Lowell built a $40,000.00 trunk line sewer through the valley to drain certain areas beyond the Cemetery and the Cemetery has permission to drain into this sewer. A topographic survey will be made. Three avenues cross the addition at the present time. One avenue is of macadam construction running in a longitudinal direction. It is well placed for drainage purposes and meets a cinder avenue at right angles. The cinder avenue to in the valley dividing the two long flat slopes and is placed just about where a topographical study would place it. Both avenues are continuances of main arteries to the older parts of the Cemetery. For the most part the contour of the ground will determine the location of the new roadways. In one or two instances the determining factor will be easy access or clearance. The addition is bounded on the west by a public highway, on the north by a row of houses, on all other sides by older parts of the Cemetery. It is planned to insure privacy on the west and north by leaving sufficient planting space for evergreens and shrubs to form a heavy, screen and at the same time to act as backgrounds for monuments. Specimen trees and shrubs will be set out on the lawns in prominent places, mostly in irregular shaped spaces that cannot be used for burial purposes beds of annual and perennials will be set out. Two inch galvanized iron mains with one inch offset lines will be set out in the three foot reserve n the side of the main avenues. Every sixty feet, a standpipe and faucet will be erected. There is a possibility that the advantages of a sprinkler system will be investigated although these systems are rather costly to build and maintain. The Chapel and Tomb are located at the entrance to the new addition. From this point one may look down on the whole development. The Cemetery has owned this land for a number of years without developing it with the exception of the avenues mentioned elsewhere. Without the original coat of the land the estimate of the total cost of the project to $54,000.00 covering such items as regrading, loam, fertilizer, grass seed, planting and, landscaping, drainage water, concrete markers, avenues (cinders), engineering and overhead. This expense will be spread over a period of years. In order that the computations of this thesis could be connected with definite points on the grounds, it was necessary to provide two bass lines one extending north and south along Immaculate Conception Avenue, the other east and west on Saint Martin�s Avenue. The north and south base line is five feet offset from the east side of Immaculate Conception Avenue. The East and West base line is six feet offset from the north side of Saint Martins Avenue. Offsets were necessary because of' a line of large poplar trees on the side of Saint Martin's avenue also on Immaculate Conception Avenue. When the base lines were definitely established they were permanently marked with stone bounds. These bounds were six inches square on top with the regulation drill hole cut in. They were five feet long and weighed about two hundred pounds. The location of these bounds are shown on the general plan. All computations are referred to these base lines. The survey is built around them, a sort of "X" and "Y" axis. In addition to the bass lines several transit lines were run off the base line usually at right angles to locate boundaries of the addition, also existing roadways and buildings. The transit lines are used also to tie in definitely the points of curvature and the points of tangency of the curves of the new roadways. The land under consideration was bought in two separate parcels. One parcel was obtained as part of a purchase, which had been laid out as a Cemetery for other owners, and was known as Saint Peters Cemetery. The other parcel was a tract of land containing about five acres known as the Parker Estate. These parcels were bought years apart. The general plan shows bow the previous owners sold lots along the boundaries and avenues oftentimes in scattered locations. In some cases clearance requirements to avoid these lots determined the location of the new roadways in this thesis. As stated previously this survey is built around two base lines. In describing the various steps it might be more clear to refer the reader to the general plan. The transit was set up at a point eight feet from the stone bound marking the sidewalk line of Court Street. This point was offset five feet from the east side of Immaculate Conception Avenue to clear a line of poplar trees. The foresight was taken in a southerly direction on a five-foot offset from the stone bound marking the southwest corner of Section 0. The instrument was clamped and a line of spikes for measuring purposes were set. Later stone bounds were put in on this line to mark it permanently. 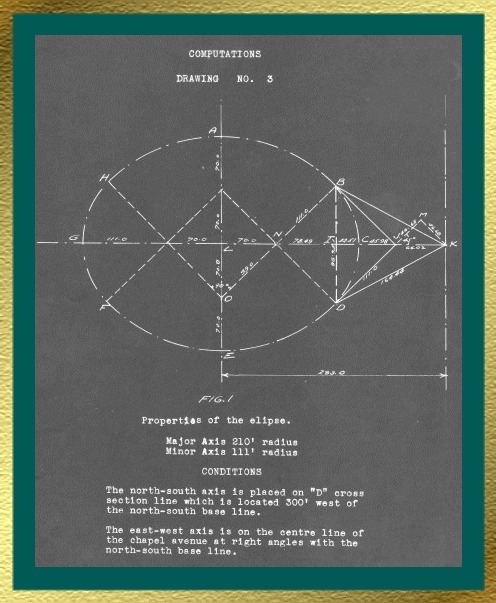 The transit was then moved to the intersection of Immaculate Conception and Saint Martins Avenue where a foresight and back-sight to previously set stone bounds were made and a right angle turned, using a magnifying glass to read the vernier. This procedure was repeated several times until the accuracy of the angle was assured. This line was then marked with stone bounds. The East-West base line was found to be six feet offset from the southwest corner of Section 0. All measurements are referred back to these two lines. Whenever a stone bound was set extreme care was used to insure accuracy. Among the precautions used were: Careful alignment, Double measurement of lines, use of a plumb bob in measuring grades and a check on the measurements by turning a right angle on the transit to point of closure of the transit line. The transit lines shown in red on the general plan are all at right angles with each other with the exception of the two-foot offset from the property line on Boston Road. From them the outlines and boundaries have been located. Additional information was secured from previous surveys and used in supplying missing data. The principal purpose of a topographic survey is to furnish the engineer with facts concerning the surface of the area to be developed. The engineer must keep in mind that the purpose of a roadway is to give easy access to the points to be reached. Next, that the roadway be built where it fits the ground. Then he must provide proper drainage at minimum expense. He must also consider where the best grades and lines can be obtained with the least amount of earthwork. Then also the lines and grades should be determined with a view of giving the road the most attractive appearance consistent with the other requirements. A modern Cemetery should have the characteristics of a park and for this reason roadways should be built on graceful lines. The roadways should not be more then three hundred (3,00) feet apart. In other words no lot should be more than one hundred and fifty (150) feet from an avenue. Sharp turns should be avoided wherever possible. Long sweeping curves are far more practical and beautiful. Keeping in mind these essentials governing the design of roadways, we have the following conditions There is a tar macadam road (Saint Patrick's Avenue) crossing a cinder road (Saint John�s Avenue) and meeting another cinder road (Immaculate Conception Avenue) at right angles. The latter avenue leads to the Cemetery service buildings and Court Street and is a much-traveled roadway. Obviously these roads are fixed and permanent. For certain distances along each of the above named roads the trunk sewer owned by the City of Lowell extends. The Cemetery gave the City the right of way through these avenues in return for drainage privileges. 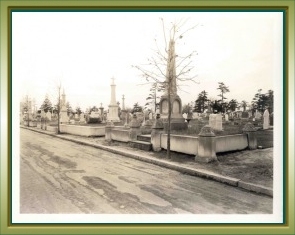 Two other conditions Governing the location of roads were: The new addition is surrounded on three sides by older sections of Saint Patrick's Cemetery necessitating crossing the addition to reach parts of the older Cemetery, and Lots sold by the owners of the cemetery previous to its acquisition by Saint Patrick's Cemetery. Fortunately the three avenues referred to as being fixed are located about where a topographic study would place them although they are part of the original "checkerboard plan". The first consideration in designing a system of roadways for a city would be easy access to all its parts. This is true also in a cemetery. Easy access when it can be accomplished without too much cut and fill is, in the writers opinion, far more important then following too closely the topographical map. We have an example of this in the cemetery at a point where it did not seem advisable to cut a road. Traffic is forced to make several awkward turns to reach a point that was almost in a direct line with a main avenue. Pedestrians simply take a short cut across the lots, wearing a path through the lawn. In the new addition at least two short avenue extensions have been placed at points where a study of the topography would question such action. In both cases the reason for doing so was easy access to other parts of the Cemetery. Beginning at the chapel, which might be considered the entrance to the new addition, a study of the general plan will show that the roadways in general follow the contour of the land and also provide easy access to older parts of the Cemetery. On the same axial line as the chapel and tomb a large ellipse has been laid out the major and minor axises being determined by the contour of the ground and clearance required to get by lots already sold. Leading from the ellipse mostly by means of parabolas are other avenues designed to divide the land into sizable sections. On the subject of roadways with relation to lot sections, it is the writer�s opinion and observation that the larger the section the more opportunity for landscaping effects. In other words many cemeteries have been spoiled because the natural beauty of the grounds presents a "cut up' appearance. They have too many roadways too close together resulting in waste of land and costly maintenance. By rearranging the roadways of the old plan enough space has been saved to provide for all the planting space required to beautify the new addition. Simple curves, reversed curves, spirals and parabolas were used in the preliminary study of the general plan. The parabola proved more practical and graceful than the other curves and for that reason has been used more extensively on the working drawings. The common practice in laying out the curves was to join two points by a straight line. This line became the chord of the curve or parabola. The offset from the tangent in some cases was scaled from the topography plan where the curve had been previously sketched free hand. When the curve was a reversed parabola the second offset was found, if possible by proportion. By adopting this method the tangent for both curves is on a straight line simplifying the fieldwork of laying out the curve. When a simple parabola was used all distances of the triangle surrounding the curve were found by trigonometry. Invariably this developed into a rather complicated process because of the number of unknown distances, which in this case were fixed. In the case of the reversed parabola some of the distances could be assumed. As a general rule the roadways will be sixteen (16) feet wide with two-foot reserves on each side. This width is adopted because the roads leading from the older sections are this width although it would be more desirable to have eighteen (18) foot roadways. Originally it was the intention of the writer to make a drainage study a part of this thesis. This idea was abandoned when it became obvious from the few test pits that were opened that sub-soil drainage is absolutely necessary. Clay was found at a depth of four and one half (4 1/2) and five (5) feet in certain parts of the addition. With clay at this depth sub-soil drainage is imperative. It is possible that the layer of' clay is seven (7) to eight (8) feet deep in other parts of the cemetery and drainage in that case would be unnecessary. To make a comprehensive test would require the opening of a number of test pits, which at this time would constitute a large expenditure of money and would also cause considerable delay. From the facts at hand we know that at least in some parts of the addition sub-soil drainage is required. This work should be done before the system of roadways is built in order that no unnecessary digging will be done after the roads have been constructed. The sub-soil drainage system will consist of a system of lateral lines crossing the lot sections and deep enough so as not to interfere with opening graves. The sub-soil drainage question together with the water system is a thesis in itself. The important thing to remember is that these two questions should be solved using the topographical map and location of roadways as determined by this thesis as a basis for much study, before any construction in started. It is possible after all facts are known that the same trench and pipe lines used for sub-soil drainage can be used for surface drainage. This however is not common practice. If it can be done in certain places considerable time and money could be saved. The subsoil drainage trench is usually two (2) or three (3) feet deeper then the deepest grave in a section. The pipe is usually akron pipe laid with open joints., and covered with twelve (12), inches of trap rock. The trap rock is covered with a sod to prevent filling the void with the backfill. On the other band the surface drains should be akron pipe with sealed joints laid at a depth of three to four feet and with sufficient pitch to carry off the surface water from the surrounding sections. Intakes or catch basins should be provided at frequent intervals so as not to allow the runoff to assume proportions that would cause wash-outs of the avenues. The catch basins should be provided with settlement basins extending three (3) or four (4) feet below the intake and outlet pipes. These basins would trap the leaves and rubbish before it could clog the system. The water caught in this sub-soil system is usually a thin, small stream flowing steadily all year while the surface drainage system provides for a large swift run-off in a short space of time. That is why it is not practical to design both systems in all cases for the same purpose. The practice now in force at the cemetery is to operate each system independent of the other. The writer has seen an eight (8) inch surface drain operating to its full capacity after a quick thaw in the spring. The force of the water was tremendous. Under these conditions open joint pipes would be undermined. In sub-dividing sections into lots each cemetery has its own problem. The lot sizes will depend on the financial status of its clients. The larger the lots the more beautiful will be the cemetery in a general sense. There is a decided tendency at the present time to purchase small lots. This tendency resulted in the over crowding of monuments a serious problem which confronts practically all cemetery authorities interested in keeping their cemeteries out of the "stone yard" class. To combat this condition the Cemetery passed rules several years ago that only one monument could be erected on a lot. Alternate lots were sold with the agreement that no monument could be erected. Twenty (20) percent of the cost was deducted from this type lot and added to the lot that had the monument privilege. Recently the rules were made more stringent and two grave lots and under in size were denied the privilege of monuments. It all cases where monuments are not allowed the lot owner has the privilege of placing a flat granite slab three (3) feet by one (1) foot on the lot flush with the grade, as a marker. With these rules and safeguards we have relieved the situation somewhat but I cannot say the problem has been solved. This is due principally to the fact that our sections have been small, the contour of the cemetery for the most part is flat or gently rolling and large areas can be seen from almost any point, despite the fact we have been planting trees, shrubbery and evergreens in various vantage points as screens. Another reason is the demand for small lots is so large. Rarely do we sell a lot larger than ten (10) feet square. It can be seen from the foregoing that careful planning to necessary to avoid the over-crowding of monuments. This consideration will no doubt be a controlling factor in the sub-division of the sections into lots. The principal reason for changing from the present system to the park plan is due to the fact that the latter plan lends itself with its winding roads and curves more readily to landscaping effects. This change will help to relieve one serious defect of the present system namely that so much area can be seen at once. The present system of marking the lot corners will be carried out in the addition. Numbered concrete markers will be set on the lot corners flush with the grade. Except in rare instances the paths will be two (2) feet wide and grassed over. They are rarely used but in case anyone has a conscience about such matters they are there for use. These paths also serve as spaces for the rows of lots. In all sections except single grave sections it is planned to landscape the areas well in advance of sale so that the lawns and shrubs will be well-established before any lots are sold. On the west and north sides of the new addition it will be noted that the old plans provided a ton (10) foot road along the boundary. The new layout closed this road and the land will be used for boundary planting. This will give privacy on the Boston Road sides will also screen out the houses on the north and will form a background for monuments within the grounds. This planting will very in height according to whether it is desirable to screen out or show a desirable view within the grounds. The outline of the beds on the inside will be winding and varying in width. The centers of sections, especially irregular tracts will be reserved for planting. Triangles formed by the inter- sections of roads will be planted to shrubs, perennials or annuals as the case may be, depending on the size and location of the triangle. We will endeavor to keep the lawns broad and undulating, with specimen trees and shrubs placed at vantage points. This planting together with that allowed to individual lot-owners such as evergreen base plantings for their monuments should break up the monotony of monuments and lawns. A special spot, and in my opinion one that can be developed into a real beauty spot is the ledge outcropping near the chapel. Rock garden plants placed in the crevices of the rock and large growing perennials at the base of the outcrop- ping would transform this location into a beautiful and peaceful garden. This discussion of the landscaping of the grounds is general and brief and is intended only to give a general idea of what the writer had in mind in placing roadways and deter- mining the shape of the section. For instance on the north side paralleling the boundary the roadway is kept sufficiently far away to allow one or two lots, and the boundary planting. The same procedure was followed near the ledge where topography was not a determining factor. A photograph of a screen planting in the cemetery, typical of the plantings contemplated for the boundaries accompany this article. This planting is used to screen out an older section of the cemetery until such time as it can be regraded. Although not a part of this thesis, plans for a new addition could not be discussed without some mention of the regrading operations that have been going on at the cemetery since 1926. Many of the sections that have been regraded adjoin the new addition, and the paths, roadways, and sizes of lots in these sections will have a direct bearing on the design of lots in the addition. Cemeteries no doubt have been regraded before but within the writer�s knowledge not on so large a scale. Saint Patrick's Cemetery is one of the largest cemeteries north of Boston, containing eighteen thousand (18,000) lots and over sixty thousand (60,000) interments. Through lack of proper restrictions dating back many years, the cemetery was literally covered with curbings, posts and monuments, many of the latter without foundations. In 1926, the present director Of the cemetery Reverend John J. McGarry, D. C. L. felt there was need for a general cleaning up and regrading. Consequently the writer was instructed to regrade a section to serve as a "model" section. The cemetery was fortunate in having given a deed of right of burial only, that enabled the authorities to exercise considerable latitude of judgment on what was right and proper, in the way of enclosures and monuments and the removal of same. Naturally the removal of curbings aroused considerable opposition from lot-owners in the first sections regraded, but the work was continued in the face of this opposition because the authorities felt that the improved appearance of the cemetery would eventually bring about a changed opinion on the part of the lot-owners. Fortunately the change in sentiment did come. From a most dilapidated appearance the property has become an attractive neat and well-kept lawn cemetery, a credit to the community and a source of real satisfaction to all who had a part in bringing the change about. Before and after pictures of the improvements are being submitted with this thesis. These pictures show how the nameplates were cut out of the curbings, and laid flush with the grade. Numbered concrete markers were set on the lot corners, and all monuments were placed on foundations and realigned. Base plantings around the monuments were encouraged and wherever possible the cemetery set out specimen tress, evergreens and shrubs. The lawns are now kept trimmed by power- lawnmowers. No charge was made for these improvements. Lot-owners who benefited by the improvements however were asked to place their lots under Perpetual Care on time payments if necessary. The response was gratifying. 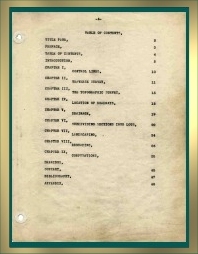 The Perpetual Care fund has risen from $18,000.00 in 1926 to over $300,000.00 in 1934. The income from this fund will serve as a guarantee to the lot-owners that the cemetery will not fall back into its former neglected end unsightly condition. The change that has taken place in public sentiment regarding the care and the improvement of our cemeteries, is as marked in the development of its expression as in the changed physical conditions it has been the means of producing. And while there exists a marked change between the appearance of the cemetery of the past and that of the present, the period of this development covers only a comparatively few years. When we use the term "modern cemetery" one assumes that reference is being made to the latest development in the cemetery field. 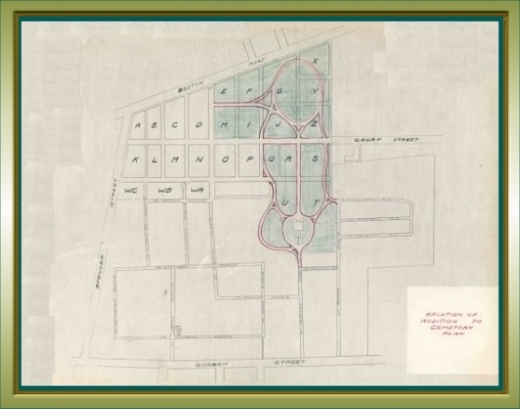 There is nothing more recent in cemetery practice than the "park plan". There has been however a development of this plan called the memorial park plan, which forbids monuments and stone markers but allows bronze markers set flush with the grade. The bronze markers turn verdigris with age and blend into the lawn. This type cemetery resembles a park and is very beautiful. The objection of those who do not care for the memorial park idea is that it resembles a park more then a cemetery. This development of course is one extreme and the old fashioned cemetery overcrowded with monuments is the other. We have gone a long way in recent years to educate lot owners to the advantages of the modern park cemetery, but I do not think they are ready at this stage to give up the idea of monuments. To change old and well-established ideas, the work of centuries requires persistent effort and careful education.